So? It's Ebay...where comical prices are frequently demanded for everything under the sun. The same place where some genius tried to auction off one of his own kidneys for $100K. Sellers are free to demand the price of a gold plated Rolls Royce, if that's what they've decided their item is "worth"..if the price is stupid enough, it'll remain on Ebay forever, or until the seller becomes less stupid. A quick glance at Sweetwater, Musician's Friend, and Guitar Center shows they're all unavailable and on back order right now. I think it's been this way for over a month. If the supply of new JTV-59s is currently limited it will drive up the price of used ones. You see that kind of thing from time to time. Line 6 still has the refurbished ones for $959 I saw one on Sweetwater's used page which allows offers/bids. I suspect the prices will return to normal on used ones. It seems to be a love/hate thing with some people who are unwilling to learn to use it deciding to sell within a few months. If I remember correctly, a couple years back the 59's were selling new for $499 or $599 in black only. I should have grabbed a backup then. Dunno Yamaha “story” and Pacifica ramifications. Is it correct to assume 59’s no longer being produced? 59 hits a sweet spot for many players and professional musical productions using 59 multiples around the world. Modeling handles Fender boink nicely and stock hum buckers sound great. Throw in the only real fixed bridge option and 59’s occupy a unique niche in Variax hierarchy. Also old 500’s perked up significantly compared to bottom prices 5 years ago. 700 Acoustics beginning to experience a similar surge in used prices, IMO…. Is it correct to assume 59’s no longer being produced? 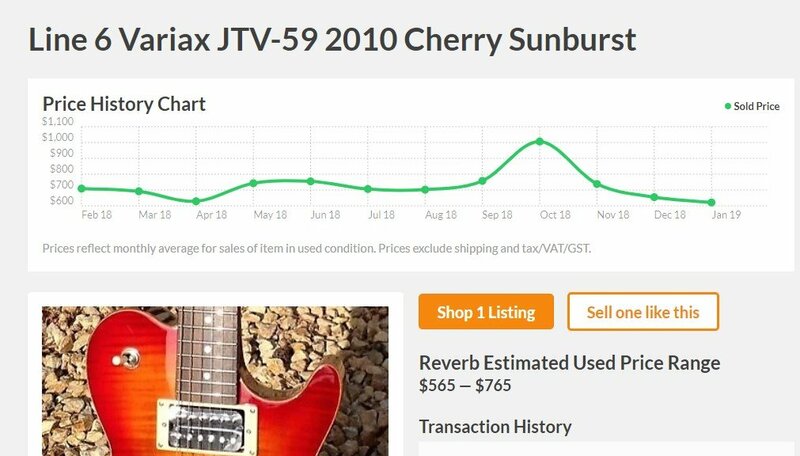 I have noticed that there are a lot fewer JTV's listed on Reverb, with the exception of the Shuriken. It would be nice to think that L6 was holding off doing a run of JTV's in order to create some demand for a soon to be released Gen 3 Variax. Time will tell. I just picked up a used 59 Tobacco Burst for $650 off Reverb in great condition might I add! but I know what the OP is talking about. I have been watching for a while and the prices have been on the upswing as listings have been sparse.